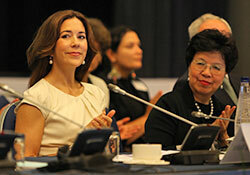 In 2005, Her Royal Highness Crown Princess Mary of Denmark became Patron of WHO/Europe. Speaking at the fifty-sixth session of the WHO Regional Committee for Europe in September 2006, the Crown Princess described her commitment to public health issues in the WHO European Region, and her plans to focus on specific areas of WHO/Europe’s work to generate greater awareness in Europe, where poor health, suffering and lack of access to basic medical services were an everyday reality for many people. Her Royal Highness made a video statement on the importance of physical activity and a healthy diet for the WHO European Ministerial Conference on Counteracting Obesity in November 2006. On 16 March 2007, the Crown Princess welcomed the First Lady of Ukraine, Mrs Kateryna Yushchenko to WHO/Europe. This visit took place during the official visit to Denmark of Mr Viktor Yushchenko, President of Ukraine. Since becoming Patron, Crown Princess Mary has been actively engaged in activities related to European Immunization Week. In 2008, Her Royal Highness attended a regional launch ceremony in Ljubljana, Slovenia on 23 April, where she emphasized the importance of immunization in an address to members of the diplomatic corps, health professionals and the mass media. Crown Princess Mary has issued statements of support for subsequent European Immunization Weeks and continues to be a strong advocate for vaccination in the European Region. Her Royal Highness visited WHO headquarters in Geneva, Switzerland in May 2008. The Crown Princess also addressed delegates at the fifty-ninth session of the WHO Regional Committee for Europe in September 2009, where she spoke of her work raising awareness of vaccine-preventable diseases and immunization, and particular concern about discrepancies in the coverage of population groups and the unvaccinated children still found in Member States. In September 2012, Her Royal Highness participated for the first time in a WHO Regional Committee session outside Copenhagen, Denmark. During her address to representatives at the sixty-second session in Malta, she emphasized her commitment to immunization and maternal and child health within the framework of the Millennium Developments Goals, and announced that she would be part of the continued efforts to meet the challenge of antimicrobial resistance.